Looking for Palawan resorts and hotels to stay in summer or for a vacation? We've got the biggest list of choices for your beach resorts and most affordable places to stay in popular destinations when you visit Palawan. See our list below from Coron, El Nido, Sabang, Puerto Princesa, Taytay and more. For more resorts listings and hotels in Palawan, please navigate below for an enjoyable theme in summer. Otherwise, visit nearby market places to buy food for your most wanted local Palawenyo authentic dishes and recipes. You might also want to check on the list of Palawan's dishes and other tourist spots and pilgrimage sites for lent observance. Summer is also time for lent in the Philippines. Palawan is no exception. Finally, our own list which we intend to grow as we go along each year and celebrate the heat of the sun in summer in the Philippines. Read our exclusive reviews about the different Palawan resorts listed below or check on our tips for best time to travel, stop overs, season fruits to buy, what to bring, itinerary samples, fastest cheapest options and way to travel to a special place you want to reach, food to eat, where to dine, people and tour guides and more. There are so many paradise places to visit in Palawan and if you are looking for a good itinerary, you can always refer to tour packages and promos being offered by different travel agencies and companies in Metro Manila. They also help you prepare your own itinerary and top tourist spots to visit in this paradise province in the Philippines. In the meantime, I took time to make an online research for websites that feature different Palawan travel packages and here they are below for reference. Price rates would range from Php 2,500.00 - Php 5,000.00 for a tour package to Palawan while inclusions might be something like this list below. Please note that at this cost, airfare is not included. It could cost you as much as Php 15,000 on the other hand. Other all-in worry-free Palawan resorts package rates may vary depending upon the places to visit and the hotel room accommodation as well as if the meals are included and airfare too. 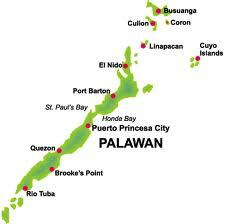 Below is our map guide of the different resorts in Palawan, Philippines. If you want to know how to get to a specific resort, you have 2 choices. It's either you come and visit our list above where you can find the complete contact details of your search for cheapest resort in the island paradise or pay them a call to ask and inquire via their telephone numbers and hotline. If there is an email address provided above, please use that to send your inquiry.